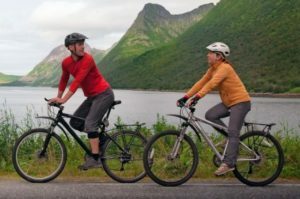 This year’s Tour de France will no doubt, inspire many people to dust off their bike and cycling helmet and take to the road, endeavouring to emulate the cycling heroes of this marathon event. As with the Australian Open which, every year, sparks enthusiasm for the game of tennis and results in a sudden increase in tennis-related injuries, the Tour de France results in an increase in cycling injuries. Ben Purcell, Dr of Chiropractic at the Bathurst Clinic thought this would be an opportune moment to present his thoughts on the best ways of preventing cycling injuries and to provide ‘would-be yellow jersey wearers’ with helpful advice on improving their cycling performance. What are the most common cycling injuries? Cyclists should always wear a well-fitting helmet but sometimes even this, is insufficient to prevent a degree of head trauma in a fall. Foot pain and/or numbness can be quite a common problem. This is commonly caused by incorrect positioning of the cleats that fix shoe to pedal so get them adjusted so that there is no excessive pressure on the balls of the feet. Ankle pain can also be caused by incorrect cleat positioning or having the saddle too high as this results in downward pointing toes and leads to Achilles tendon problems. Knee pain is commonly caused, by micro injuries escalating into an overuse injury. Correctly positioned cleats, and the prescription of appropriate cycling insoles can help. Ask your Chiropractor about these. Saddle sores can often be avoided by adjusting saddle height but it is important to minimise friction between skin, clothing and bike. Wearing appropriate gear and applying a good anti-friction cream will help. Low Back Pain is a common problem for cyclists. Your Chiropractor can help by ensuring your bike is adjusted correctly, so that your back is in optimum position when riding. Similarly, with neck pain, adjusting the bike frame to enable a more upright riding posture can be of great benefit. Improving your performance on the bike, relies on putting in some training time, off the bike! Good core strength is as important as cardiovascular health. Check with your Chiropractor as core strengthening exercises cannot be performed on the bike. The benefits include the ability to pedal harder and to maintain a more aerodynamic position. Avoid tight calf muscles and hamstrings by having a regular warm up and cool down routine before and after cycling to stretch those muscles. Improve your cycling position, your Bathurst Chiropractor can advise on correct breathing techniques that can help to improve lung function as well as relax body tension. A training program that includes sprints and interval work will help with power, strength and performance. The next step is to call your Bathurst Chiropractor for advice on the points mentioned. Call the practice now, on (02) 6331 1004 arrange your appointment for help with preventing and treating cycling injuries and taking your performance to the next level.